This projection is in the initial phases and we welcome any feedback you may have from your personal experience (contact David Coltrain). The information listed below is in summary form, please link to the original PDF containing details for production expenses, fixed costs, income sensitivities and return over costs sensitivity. 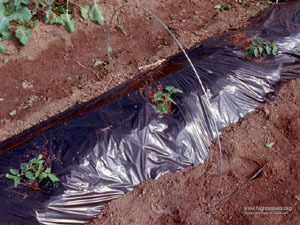 Young Tomato transplants in black plastic with wire hoops in place to support rowcovers. 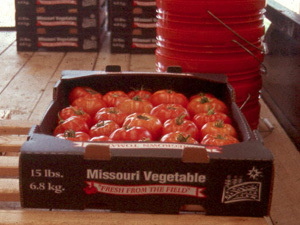 Single layer of Tomatoes ready for shipment in Truxton Missouri. The listserv is a great place to learn what growers are doing with high tunnels, what crops and varieties do best, and what practices have been successful on local farms.